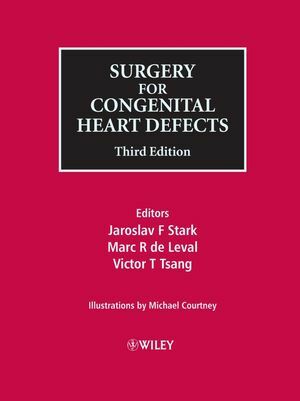 Over 10 years after the publication of the second edition, Wiley now publishes the third edition of the popular volume Surgery for Congenital Heart Defects. Completely updated and expanded, this new edition describes step-by-step the surgical procedures for congenital heart defects and includes detailed illustrations for each operation. New in this edition are chapters on exercise testing, MRI, EP studies and catheter ablation of arrhythmias, extracorporeal circulatory support and paediatric lung transplantation. A greatly expanded ultrasound chapter contains numerous colour Doppler’s of many conditions. Mr Jaroslav Stark is emeritus consultant cardiothoracic surgeon at Great Ormond Street Hospital, London, UK. Mr Marc de Leval is Professor of Cardiothoracic Surgery at the Institute of Child Health, University of London, UK. Mr Victor Tsang is consultant cardiothoracic surgeon at Great Ormond Street Hospital, London, UK. 1: Classification and Nomenclature of Congenital Heart Defects (R. H. Anderson and F. J. Macartney). 2: Surgical Anatomy (R. H. Anderson and A. E. Becker). 3: Echocardiography (I. D. Sullivan and V. M. Gooch). 4: Foetal Echocardiography (L. D. Allan). 5: Magnetic Resonance Imaging and Computed Tomography in the Diagnosis of Congenital Heart Defects (V. Mutharangu, A. M. Taylor and R. Razavi). 6: Invasive Investigation and Exercise Testing (G. Derrick and J. F. N. Taylor). 7: Interventional Catheterization in Congenital Heart Defects (P. Bonhoeffer and Y. Boudjemline). 8: The Anatomy of Ventricular Septal Defects and Their Conduction Tissues (R. H. Anderson and A. E. Becker). 9: Use of Pacemakers and Defibrillators in Children (P. G. Rees). 10: Catheter Ablation of Arrhythmias (M. Lowe). 11: Perfusion Techniques (T. Jones and M. J. Elliott). 13: Intensive Care Management of the Postoperative Patient (D. Macrae and J. Larovere). 14: Paediatric Cardiac Mechanical Support (A. Karimova and A. Goldman). 15: Surgical Approaches (J. Stark and V. T. Tsang). 16: Systemic-to-Pulmonary Artery Shunts (C. van Doorn and M. R. de Leval). 17: Pulmonary Artery Banding (V. T. Tsang and J. Stark). 19: Persistent Ductus Arteriosus (J. Stark and V. Hjortdal). 20: Coarctation of the Aorta (V. T. Tsang and J. Stark). 21: Interruption of the Aortic Arch (J. L. Monro). 22: Vascular Rings (M. R. de Leval and M. J. Elliott). 23: Anomalies of the Systemic Venous Return (C. van Doorn and M. R. de Leval). 24: Total Anomalous Pulmonary Venous Return and Cor Triatriatum (V. T. Tsang and J. Stark). 25: Secundum Atrial Septal Defect and Partial Anomalous Pulmonary Venous Return (J. Stark and V. T. Tsang). 26: Ventricular Septal Defects (C. van Doorn and M. R. de Leval). 27: Atrio-ventricular Septal Defects (A. D. Pacifico). 28: Right Ventricular Outflow Tract Obstruction with Intact Ventricular Septum (C. van Doorn and M. R. de Leval). 29: Tetralogy of Fallot (E. L. Bove and J. C. Hirsch). 31: Absent Pulmonary Valve Syndrome (M. J. Elliott). 32: Double-outlet Right Ventricle (V. T. Tsang and J. Stark). 33: Mustard Operation (J. Stark). 34: Senning Operation (A. D. Pacifico). 35: Surgery for Complex Transposition (V. T. Tsang and J. Stark). 36: The Arterial Switch Operation (R. B. B. Mee). 37: Surgery of the Left Ventricular Outflow Tract (V. T. Tsang and M. R. de Leval). 38: Persistent Truncus Arteriosus (M. R. de Leval). 39: Atrio-ventricular Discordance and Congenitally Corrected Transposition (R. B. B. Mee and J. Stark). 40: Single Ventricle (C. van Doorn and M. R. de Leval). 41: Hypoplastic Left Heart Syndrome (C. Pizarro and W. I. Norwood). 42: Congenital Malformations of the Mitral Valve (A. Carpentier and C. Brizard). 43: Malformations of the Tricuspid Valve and Ebstein’s Anomaly (A. Carpentier and C. Brizard). 44: Aortopulmonary Window (J. Stark and V. T. Tsang). 45: Congenital Anomalies of Sinuses of Valsalva and Aorticoventricular Tunnel (V. T. Tsang and J. Stark). 46: Congenital Coronary Artery Fistula and Anomalous Origin of the Left Coronary Artery from the Pulmonary Artery (V. T. Tsang and J. Stark). 47: Surgery for Arrhythmias (Y. Ishii, J. L. Cox and R. J. Damiano). 48: Paediatric Heart and Heart–Lung Transplantation (J. Wallwork, A. R. Hosseinpour and M. Burch). 49: Paediatric Lung Transplantation (J. J. Nigro, R. D. Bart and V. A. Starnes). 50: Miscellaneous: Straddling Atrio-ventricular Valves (Pericardium, Tumours, Diverticula and Ectopia Cordis, J. Stark and V. T. Tsang). 51: Data Collection and Assessment of Performance in Congenital Heart Surgery (S. Gallivan, J. Stark, N. Kang and V. T. Tsang).